I have a 2013 C-Max Sel. It has 12,000 miles on it. Since my last trip to my dealer I have been recieving emails and mail telling me "tires require immediate replacement". The tires look fine, tread looks fine, I cannot understand. What kind of tire needs replacement after 12,000 miles. Is this normal for the C-Max? What's everyone elses experience been with the Michelin tires? I use this vehicle for picking up my grandkids from school and it has no hard driving on it. Sounds like the dealer trying to scam you. I remember getting an email from the dealer telling me I needed an oil change after 3 months or something ridiculous like that. Every time I've been to the dealer (at least 1/2 a dozen times), Ford does an inspection of the car including tires The inspection report (Vehicle Report Card) is always attached to the service order. You should have the same. What does this inspection report show for tread depth of the tires and any other issues with the tires??? Who is sending the emails and mail? the dealer or some other entity. Can you unsubscribe to the emails? Edited by Plus 3 Golfer, 02 February 2016 - 04:50 PM. What did the dealer say when you picked up the car? If they did not tell you it needed tires then I would think that someone entered something wrong in the computer. Just a guess. I would talk to the dealer about the emails. I just talked to the Michelinman Concierge Service and I told him that I was interested in the contact patch area change from 38 to 50psi of my Michelin Energy Saver A/S tires. He said he didn't know even know how to get that info, but the important thing was to get even tire ware across the tire which gives the maximum tire contact patch. He said the Michelin Energy Savers have a 55K warranty and I told him I was using 50psi and got 64K mi. out of my first set and 58k mi. on my second set so far. On my first set there was only 1/64" difference in ware from the outside edge to the inside edge which he said was very good and recommend keep using 50psi in the tires! So there you have it, Michelin rep recommends 50psi! BTW his # is 1-888-633-3339. Also most members wouldn't notice a difference between 38 and 50PSI in their tires so try it out and let us know what you think. Well, Paul, that's good to hear as there is so much controversy and, IMO, misinformation about tire pressures. One guy at my Michelin dealer gets torqued up when rotating them and finding elevated pressures - "they will wear out in the center" (really? are they bias-ply? - then why did my 1st set wear out on the edges even though I ran elevated pressure??? - and go over 70k miles??? ), or he says "Michelin won't honor the warranty if they're run over 44 psi" (really? - with the sidewall rated at 51???). I think you're right about most people not noticing the difference but there is a difference. I can feel a bit more "thump" going over sharp ridges but all the rest of the time you get better handling. I like the feel of the car better at higher pressures. Edited by SnowStorm, 02 February 2016 - 09:36 PM. We've crept up to 46 PSI cold, 48+- hot (38, 40, 42, 44, 46). Really love the 46 PSI ride - 38 is too soft / sluggish, even though the difference (38 to 46) is not that much. Sure glad you high mile guys are here to report longevity results ! Edited by C-MaxSea, 02 February 2016 - 09:42 PM. I started using increased tire pressures in 1980. That's the year I attended my first drivers' school, and the first thing they required all drivers to do was increase front tire pressures to the sidewall max. This was done for safety, so no one broke the bead seal in the hard cornering that was the purpose of the school. The explosive decompression of a tire when it comes off the bead is frequently followed by a roll-over when the bare wheel digs into the asphalt. I soon learned that was just the starting point. A little white shoe polish on the edge of the tire let you fine tune tire pressures so all four wheel had the same grip. I drove for years at 44 front, 35 rear, as that was my optimum. Eventually, I just brought the rears up to match the fronts, as a RWD car with a little oversteer is a lot of fun to drive. So here's my tire wear as of November, when I did the OEM/snow swap. I measure 9 points, IB-C-OB at three locations around the tire. There's a wiggle in the OEM data because I replaced a tire the second season, so I'm only tracking three. Given my driving style, I'm not complaining about a ~40K projection for both tires, which have been inflated to their sidewall rating since shortly after I inherited the car at 8K miles. So if 50PSI gives the best tire wear, what tire pressure are you using? I have a 2013 C Max that I bought new in December of 2012. It has run 30,000 miles. The tires are the originals and have good tread life left. Should I be concerned about dry rot or some other issue and replace the tires now? I have almost 79K mi. on my Michelin's using 50psi in about 2.5 yrs. I should be able to make 85-90 k miles. 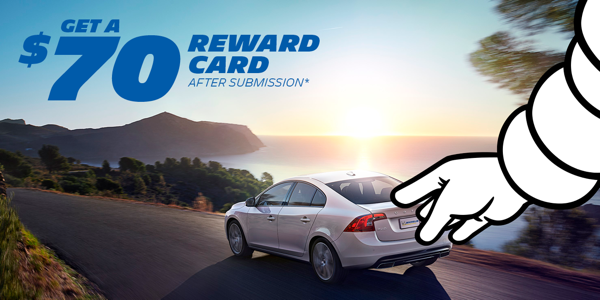 Michelin is a special with buying a set of tires getting a $70 MasterCard reward card to Sept. 20, 2018. LOVE YOUR DRIVE. FALL INTO SAVINGS. purchase of four new MICHELIN® passenger or light truck tires. Offer valid August 22 - September 20, 2018. Edited by ptjones, 25 August 2018 - 12:56 PM.